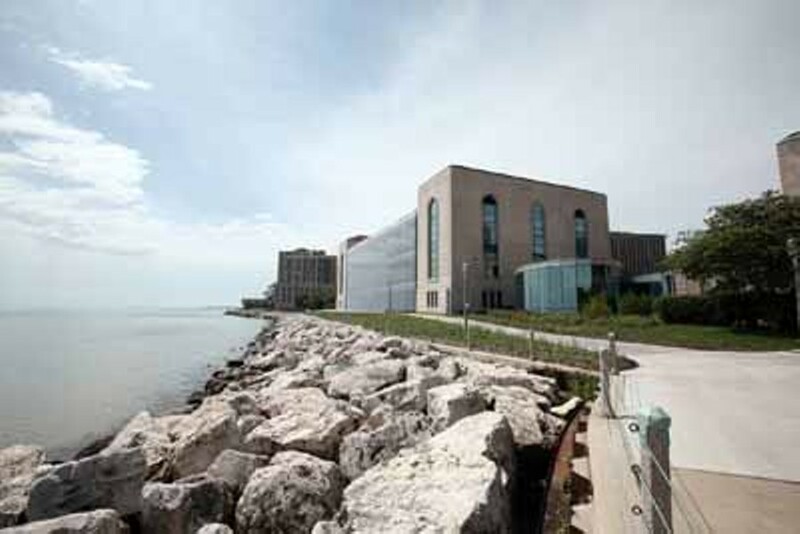 Loyola University Chicago The lakeside Jesuit institution is in the process of developing a "Campus East" quad, defined in part by three linked buildings, two of which—the Elizabeth M. Cudahy Memorial Library and the Madonna della Strada Chapel—were created by high-end Chicago architect Andrew Rebori. Designed as a pair but built nine years apart due to the Great Depression, they process collegiate Gothic through the filter of art deco. While the 1930 library has spent the last 40 years wrapped in a windowless addition that obscures most of the original exterior, its south facade is still visible, and the main reading room retains its mural by John Warner Norton, known for his work at the Chicago Board of Trade. The chapel, built to the south of the library in 1939, stands unmolested. Futuristic in a Buck Rogers sort of way, its streamlined exterior features a bell tower and extensive decorative stonework, including intricate geometric designs on the dramatic main entrance. The newly refurbished interior features a marble font, as well as paintings of the Stations of the Cross on gold leaf. The Richard J. Klarchek Information Commons, barely a year old, is connected to the two Rebori buildings by covered, arched walkways. Built by the Chicago/San Francisco firm of Solomon Cordwell Buenz, this electronic resource center—a "library without books"—is most striking for its transparent main study areas and environmental bona fides. It's received LEED silver certification andincorporates an innovative natural ventilation system that conserves heat in the winter and cools the space in the summer.